Congrats on the raise. Too bad it’s gone already. For health insurance. As various news organizations reported, anxious Americans will vote in less than a month with health care as a dominating concern. 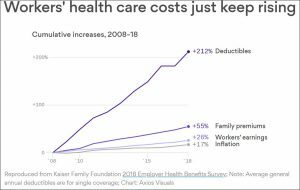 A new annual report shows why: Medical costs keep rising, as does the cost of health insurance, notably the coverage most of us get from our employers. Companies keep pushing on to workers higher premiums and deductibles that race ahead of inflation and devour wage growth. 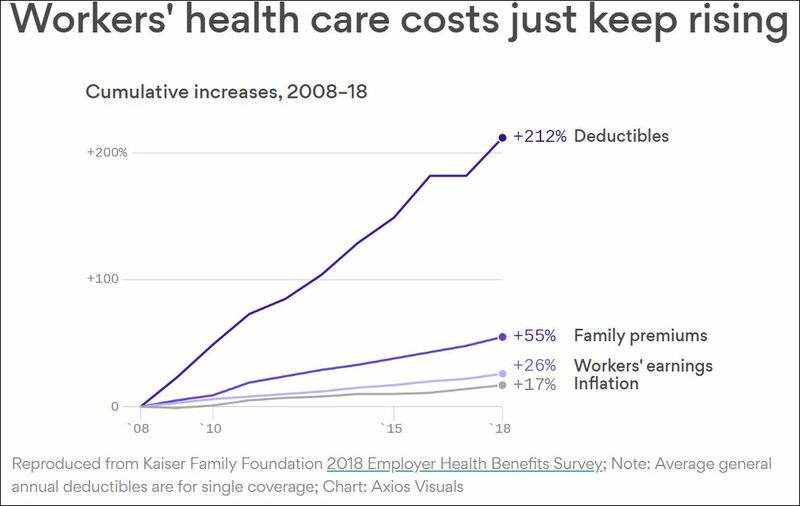 Deductibles — the out-of-pocket costs that patients must pay before their coverage kicks in and benefits them — have skyrocketed since 2008, growing by 212 percent. That’s eight times faster than wage growth, and 12 times faster than inflation, according to the latest research by the Kaiser Family Foundation. The average deductible, $303 a decade ago, now has hit $1,573 for single coverage. That’s a significant cost burden for workers just to start receiving health coverage benefits, especially when their finances are rocky to start. Because the recovery from the Great Recession has been so uneven and income inequality keeps soaring, too many Americans lack the financial stability such that, they would struggle and might need to cut essentials or sell personal items to pay a $400 unexpected expense, studies have shown. What is occurring is that many individuals and families, even if they pay for and carry health insurance from their jobs, forego needed medical services. They skip or lessen dosages of costly prescription drugs. They keep their fingers crossed that their children, especially, don’t get sick or injured. In my practice, I see the harms that patients suffer while seeking medical services, and their struggles to access and afford safe, efficient, and excellent medical care. Health coverage plays a crucial role in preventing unexpected medical costs — which can rise up for all of us in a blink due to illness or injury — from bankrupting us and reducing our lives to shambles. Insurance spreads costs among a wider group, so we share them and help each other out. But political partisans philosophically disagree with this approach. They would push us all out on our own, as they have shown with their repeated attacks on the Affordable Care Act, aka Obamacare. Lots is going on with health coverages, and we all need to inform ourselves as much as we can for our own protection and benefit. It’s a historic anomaly that most of us get health insurance at our workplaces, and, though employers may have genuine wishes to protect and improve their workers’ well-being, let’s not be naïve: Health coverage is just another business cost for too many CEOs and executives. They’re driven by increasing shareholder returns, fattening stock prices and maximizing profits. If they can do so by cutting worker health coverage or force them to bear a groaning and larger share, why won’t they? If Obamacare’s protections — on essential benefits, preexisting conditions, and lifetime benefits — can be upended, how long would it be before company plans dropped them, too? America’s wealthy companies, along with the richest elite, this year got a tax cut exceeding $1 trillion from the GOP-controlled Congress and the President. How many stories have you read about them applying that to worker health costs?